The Giant's Causeway has a special place in my heart. It's partly due, of course, to the unparalleled geological wonder of those interlocking hexagonal stones and the beautiful shapes they form as the Causeway reaches out into the cold, deep waters of the north Altantic. But mostly, it's because of my personal history there.Whether it's visiting in the middle of winter, when a bitter Atlantic storm is thrusting crashing waves onto those stones, while the biting wind blows away at the weariness of your soul. Or it's sitting on those self same stones for a summer sunset, feeling the warmth of the day still radiating from the columns below, while the skies above are painted in the tranquil pastel colours of a gloriously long summer' sunset. But especially, it's those nights down there. From times I was trying for a Milky Way shot, when the darkness was so thick and tangible that you could almost reach out and touch it. To times when I've sat alone at the waters edge, well into the wee small hours of the night, watching the majesty of an amazing aurora display cause the sky to dance above and before me. This magical place keeps calling me back - and that's a call I'm more than happy to answer. So, you can imagine my sheer delight when I received an email towards the end of last week from the National Trust at the Causeway. They had noticed the photos I've taken of the Causeway, as I tried to capture my love for the place. And they wanted to ask me along to a special invitation only photo opportunity. To celebrate St Patrick's Day, and as part of the Tourism Ireland Global Greening festivities, they were going to be 'greening' the Causeway (the first time the Causeway has taken part in this event). After all of a few seconds thought, I replied with an enthusiastic 'yes'. Fast forward a few days, and there I was, back at the Causeway just after dusk, one of only five local photographers privileged enough to be there. It was like this was the Chocolate Factory and here I was, not with a golden ticket, but with the most amazing green light installation. What followed were two amazing hours, wandering around the stones, looking for compositions and angles that would do justice to this amazing view. And the weather was awesome. Not only was it incredibly mild for March, but a gentle mist had been building in the evening along the north coast. 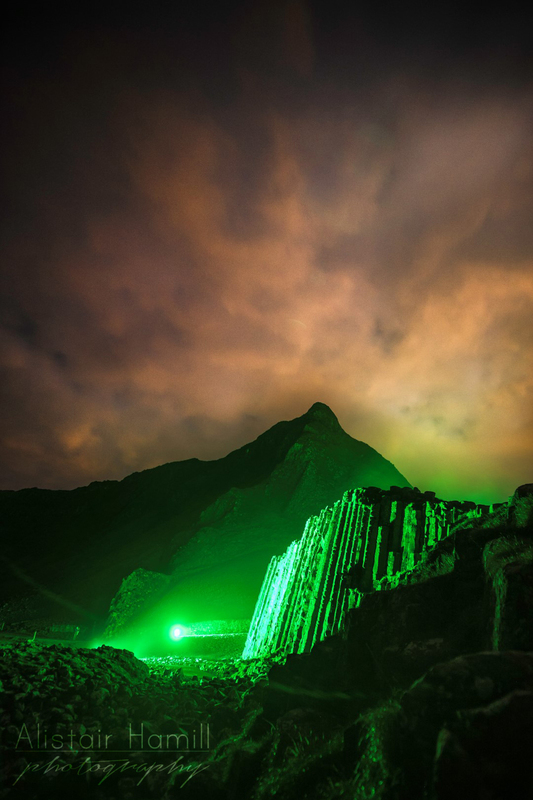 It draped itself across the stones, reflecting and refracting back the stunning green light, almost as if the atmosphere itself had turned on a natural smoke machine to create the perfect conditions for the light. And the skies above were filled with dappled, textured clouds, painted subtly with the oranges of light pollution from nearby towns and villages. I'd like to thank Jen and Eleanor and the rest of the team from the National Trust at the Causeway for this amazing opportunity. I have had many, many memorable times in this amazing location. But the global greening for St Patrick's Day is going to take some beating in the future!